In December 2017, European Union blacklisted 17 countries for being tax havens and use of these locations by companies and individuals for money laundering, tax evasion and criminal activities. But after reviewing the steps taken by these countries in the later months, now the EU has decided to remove the names of 8 countries from this list. The purpose of this latest step is to reward those who are doing serious efforts to eliminate financial criminal activities and put pressure on those who are stubborn and haven’t did much to prevent such activities in their jurisdictions. Good news for those who have setup or are considering to establish an offshore company in the UAE that the efforts and legal measures taken by the country have been recognized by EU and there is now no problem for the citizens of European Union to setup offshore companies in any of the offshore jurisdictions present in UAE. Contrary to several other countries, UAE has multiple jurisdictions (RAK Offshore, JAFZA Offshore, Ajman Offshore) in various emirates that provide facilities for overseas companies and the latest decision will be applied on all these jurisdictions. 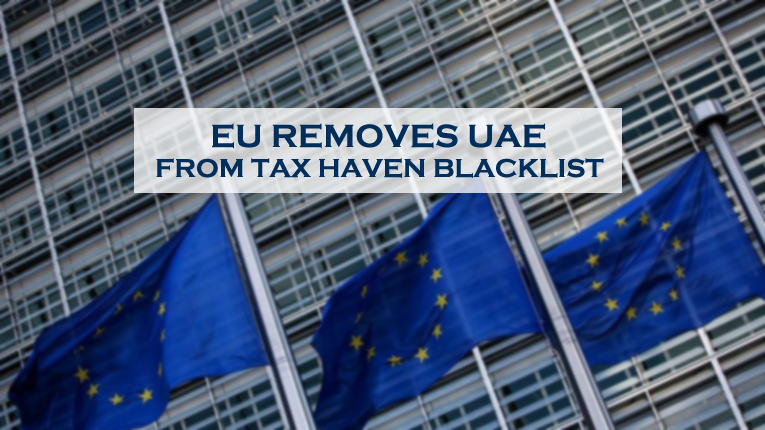 The reason for delisting UAE and 7 other countries from this blacklist is their assurance and the measures they took to ensure tax transparency. But it doesn’t mean that the tax rules for offshore companies have changed in UAE. These companies will remain tax-free but a more transparent and clear system will be adopted by UAE that will prevent any irregularity in the tax system. According to details, the recommendation of delisting UAE and 7 other countries was made by EU officials and the matter will be discussed by EU ambassadors in a meeting on Wednesday and it will soon be adopted by finance ministers of EU in the next week. The latest decision is a sigh of relief for those having offshore companies in UAE and it also proved the commitment and sincerity of the UAE’s government to provide best opportunities for foreign investors along with fulfilling its international duty of elimination of tax fraud and criminal money. The decision will enhance reputation of UAE among entrepreneurs around the world. If you are willing to open an offshore company in any of the offshore jurisdictions in UAE, you can contact Riz & Mona Consultancy via our WhatsApp # 971-56-9971225 or email [email protected] We are registered agents at RAK Offshore.